HARTFORD – The Connecticut Jewish Ledger will kick off a celebration of the weekly newspaper’s 90th anniversary with a lecture by the renowned scholar and author Dr. Charles A. Small, an expert on global antisemitism. Dr. Small will discuss “Understanding Contemporary Antisemitism and Combating it Effectivelly,” as part of the N. Richard Greenfield Jewish Ledger Lecture Series, named in memory of the newspaper’s former publisher, “Ricky” Greenfield, z”l, who died in April 2014. The talk will be held Thursday, April 4, 7 p.m. at the Mandell Jewish Community Center, 335 Bloomfield Avenue in West Hartford. It is presented by the Ledger in cooperation with the Mandell JCC, the Jewish Community Relations Council of the Jewish Federation of Greater Hartford, WeHa Magazine, and several West Hartford synagogues, including Beth David Synagogue, The Emanuel Synagogue, Young Israel of West Hartford and Congregation Beth Israel. Small is founding executive director of the Institute for the Study of Global Antisemitism and Policy (ISGAP). He currently is also a senior research fellow at the Moshe Dayan Centre for Middle East and African Studies at Tel Aviv University and the Goldman Fellow at the School of Political Science, Government and International Affairs at Tel Aviv University. He will also be a visiting academic and senior member of St. Antony’s College at Oxford University. 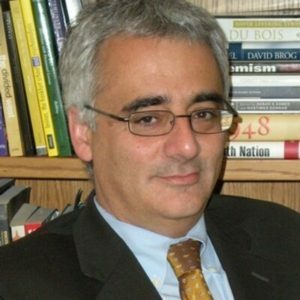 He previously served as founding director of the Yale Initiative for the Interdisciplinary Study of Antisemitism (YIISA), the first interdisciplinary research center on antisemitism at a North American university. Small also served as the Koret distinguished fellow at Yale University, the Hoover Institution, and Stanford University. At ISGAP, Small has convened groundbreaking academic seminar series, conferences and programming in the emerging field of contemporary antisemitism studies at Harvard University, Yale University, Columbia University, Stanford University, Fordham University, McGill University, University of Miami, La Sapienza University in Rome, the Sorbonne in Paris, the National University of Kyiv, the CNRS (the French National Center for Scientific Research or Centre national de la recherche scientifique), and other top-tier universities around the world. 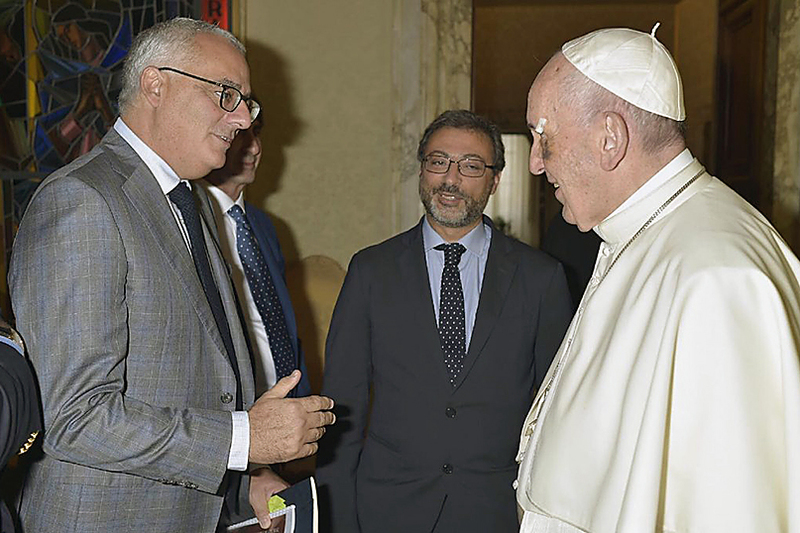 He also founded and directs an annual program at St. Johns’ College, Oxford University, which trains professors from around the world to develop new courses on contemporary antisemitism. The author of numerous books and articles, Small recently published volume three of his work The ISGAP Papers: Antisemitism in Comparative Perspective. 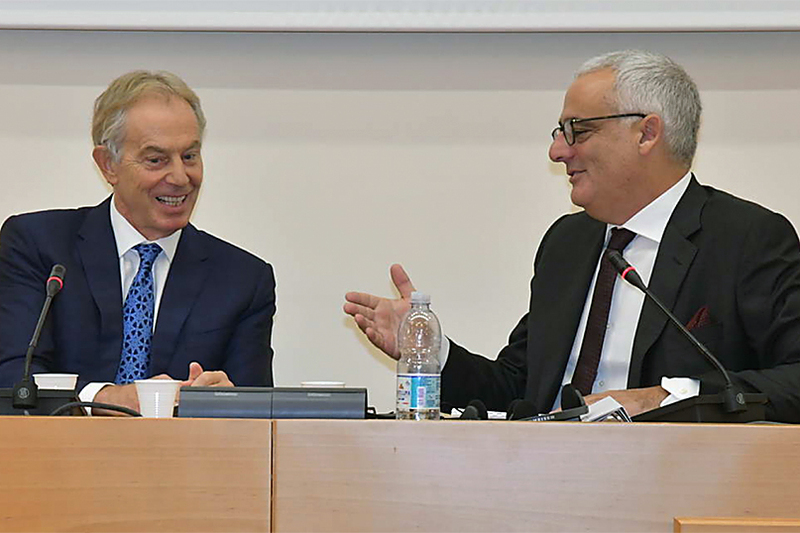 Charles Small chats with former British Prime Minister Tony Blair 2017. Small has been a guest scholar and lecturer on the topic of antisemitism at hundreds of universities throughout the world. He also addressed the European Parliament, United Nations, Israeli Knesset, the Australian, British, Canadian, Chilean and Italian Parliaments, the German Bundestag. He submitted evidence to the British and Canadian All-Party Parliamentary Inquiries into Antisemitism and continues to help inform public policy. 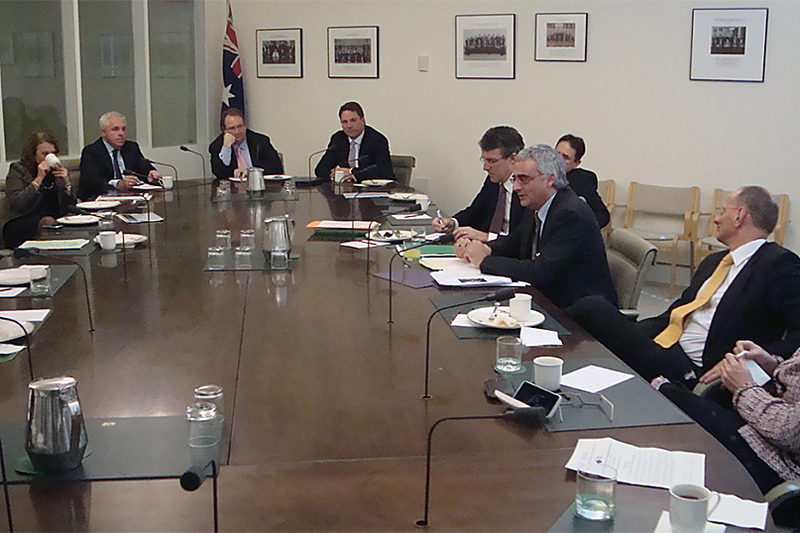 He has also served as a consultant and policy advisor in North America, Europe, Southern Africa, and the Middle East. Committed thought his life to safeguarding human rights and democratic principles, Small chaired the African National Solidarity Committee of Canada and worked with the ANC leadership and the international anti-apartheid movement. He was also active in the Student Struggle for Soviet Jewry, chairing the SSSJ in the early 1980s while an undergraduate at McGill University, as well as the struggle for Ethiopian Jewry. He has also been engaged in promoting rights of the First Nations in Canada. Dr. Small’s talk is free and open to the public. A reception will follow. To RSVP, email rsvp@jewishledger.com. For information, call (860) 231-2424. JEWISH LEDGER (JL): It would seem that the need for the Institute for the Study of Global Antisemitism and Policy, which you founded, is growing more and more pressing. Can you tell us about its genesis? CHARLES SMALL (CS): The reason why I started ISGAP is a good question. I was very active in issues of human rights. I had been chairperson of the Student Struggle for Soviet Jewry at McGill University. I went to Russia as a kid to meet with the refuseniks. Our community was very active with Ethiopian Jewry – we brought Ethiopians to Montreal before they were able to come to the U.S. or go to Israel. I was very active in the anti-apartheid movement as chairman of the African National Solidarity Committee of Canada. So, I come from a background of human rights, fighting different forms of racism and promoting citizenship. I was in Israel as a young scholar, teaching at Tel Aviv University, when I came across the writings of the Muslim Brotherhood. I had never really heard of them. I never studied them and it was through actually meeting some Palestinian scholars that I became aware of the importance of the Muslim Brotherhood and their ideologies and teachings, which go back about a century. I was shocked to see how they fuse their version of Islam or political Islam with European antisemitism – the Protocols of the Elders of Zion and Nazi antisemitism. I was shocked by it, and I was shocked by the ignorance and acquiescence in the western universities and the media of record to this very dangerous anti-democratic, reactionary, social movement, that was not only antisemitic but sexist and homophobic as well, and was out to destroy democracy. That was the impetus to really start to see that antisemitism was beginning to make a comeback. So, I thought to try to create some sort of research center to deal with it; to study it and make it have a higher profile in the academy. So, I started reading about the Muslim Brotherhood in the late 1990s and we started forming ISGAP around 2003 and 2004. JL: How would you define ISGAP’s mission? 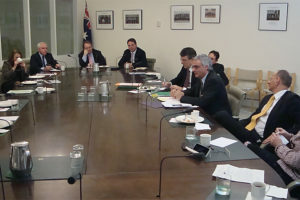 Dr. Small briefs the Australian Government, 2009. JL: Is the antisemitism we see developing in America today the same ‘strain’ of antisemitism that seems to be overtaking Europe? Or are we experiencing something different? CS: Each country, each contex,t has its unique forms and manifestations of antisemitism(s), but I think there is a global phenomenon of antisemitism which is sweeping the western world. I would argue that the United States is probably 10 or 15 years behind Europe, but it’s certainly here now, unfortunately. There are unique elements to antisemitism in the U.S. but it is a global phenomenon that we need to map and decode and combat. JL: In recent days, there have been all these reports and studies indicating a steep rise in antisemitic acts in the U.S. This seems to have shocked American Jewry. Are you equally surprised – or was this something you saw coming? CS: No, I’m not shocked. It’s to be expected. I think that when administration after administration after administration engages entities, parties and even states that promote and adhere to an annihilationist perspective of Israel and Jews; when the previous administration engaged the Muslim Brotherhood and the Iranian revolutionary regime, and they were not the first to do so; when these sort of reactionary political movements are using the Protocols of the Elders of Zion and genocidal antisemitism in their rhetoric and in their policies for generations and we engage them… When we do this, why are we surprised when a white supremicist pops up in the United States with the same ideology as somebody in Egypt, Cairo, Tehran or Gaza, or in the suburbs of Paris? Why do we think we’re so immune from this form of antisemitism? The ideological roots of white nationalist antisemitism in this country and Islamist antisemitism in various parts of the world is the same. The root is the Protocols of the Elders of Zion and classical forms of European antisemitism. If we tolerate it over there, why are we shocked that it pops up over here? JL: A lot of what you’re talking about sounds like it is emanating from the right. But there also seems to be an antisemitic strain alive and well on the left – on college campuses, etc. Is that of equal concern? CS: I think there are three forms of contemporary antisemitisms. You have the extreme right, the extreme left, and the extreme Islamists. Radical political Islam was speaking for decades about ridding the West and ridding the Americans and ridding the Jews and the Zionists from this sort of neo-imperialism and colonialism of the Middle East, and the so-called radical left in Europe, particularly intellectuals and journalists and the media of record, went along for the ride. They were equally critical of the United States and particularly of Israel and Zionsim. To be liberal means you believe in democratic processes and democratic societies and strong citizenship and equality under the law for every citizen regardless of background – but these liberals, in a sort of post modern moment, got in bed with radical Islamists. So there’s this kind of deeply hypocritical and contradictory red-green alliance that emerged that was against racism and colonialism and, in particular, against Israel and Zionism. When the extreme green and the extreme red have something in common and it’s Israel, we know that this is a warning sign of something that’s going on that’s not good for democracy and not good for human rights. JL: In 2004, Elie Wiesel said the Jewish people were living in a time of great “urgency” – then he corrected himself to call it a time of great “emergency.” Was the rise and re-emergence of antisemitism apparent that far back? CS: Definitely. It was already happening. On campuses in the United States, one of the things which was astounding to me – and certainly this was happening in Europe perhaps even more intensely – was that scholars who were looking at the antisemitism or the anti-democratic nature of political Islam were perceived as right-wing, as defenders of Zionism and racism. It’s astounding. People were not looking at the issues. There was no analysis. Charles Small presents Pope Francis with policy papers on global antisemitism at the Great Synagogue of Rome, 2016. JL: Do you think that at that point in time there was something that the organized Jewish community could have done to combat this that they didn’t do? Were they hiding their heads in the sand? CM: It’s a good question. I think that there was an arrogance, pardon my language, among liberals in our community, in the intellectual community, and in the media of record, who thought that demonization of Israel and the Zionists was a problem for our brothers in the Middle East. I think many liberals thought that if only the Israelis would be a little more flexible and would negotiate a resolution to the conflict everything would be ok and it would keep antisemitism off the map. What we realized was that political Islam could not accept the self-determination of anybody to be equal to that of a Muslim, and the Jews are the only people with self-determination in that part of the world. It is untenable for Islam to accept that a Jew is equal to a Muslim in the democratic society of Israel. Even if Tel Aviv were a nation state then Tel Aviv would be a problem because there would be Jews and Muslims and gay people and everybody else would be equal under the law. It would go against the teachings of political Islam. As Israel was becoming demonized, we see people going to synagogue on Shabbat in France, in Belgium, in the UK and in other parts of Europe suddenly being targeted. Because if Israel is a racist, fascist apartheid regime, as the extreme left and the intellectuals were arguing, then kids going to camp or going to synagogue had a deep affiliation to Israel and were part of the problem. This contemporary form of antisemitism is an attack on who Jews are as a people. So, there’s the old racist form of antisemitism which exists, and we see this on the extreme right in the US; and there’s the Christian antisemitism of the past, though religious forms of antisemitism are around but are not the dominant form. The dominant form of antisemitism is the attack on who Jews are as a people. I think that, yes, the Jewish American community as a whole thought that they were somehow immune from this. I think they underestimated the power of antisemitism which is a deadly form or strain of hatred that can change and metastasize quickly and affect societies in powerful ways. We are now catching up to understand what the problem is and how to confront it. JL: Do you worry about a legitimization of antisemitism with the election of legislators such as Congresswomen Ilhan Omar and Rashida Tlaib? CS: Yes. Americans have to realize that we’re part of the global economy and social media. Information and ideas travel at the speed of light. We’re not protected by an ocean the way we may have been 150 years ago. We’re part of a global world where information, ideas, people, and capital are flying around at breakneck speeds. Thus, the ideas that these two congresswomen are expressing are in keeping with the Nation of Islam and [its leader] Mr. Farrakhan. It’s in keeping with a strain of antisemitism that exists in the US and has existed in the US for a long time – from Henry Ford to Louis Farrakhan. These are the ideologies that are part of political Islam in Muslim countries and sort of post-modernity in so-called progressive secular ideologies. And so, the demonization of Israel is spreading. It’s part of a large discourse that is deeply rooted in the US and there is a long history of it. It’s now becoming more and more mainstream. Around the world – in the US and certainly in the US – the center is under attack by the extreme right and the extreme left and Islamists. It’s a serious issue and I don’t see this going away. I think Americans underestimate the power of ideology. This is not just two congresswomen articulating these views – these are very powerful ideas that are prevalent in international political and cultural discourse. JL: At the risk of sounding alarmist, do you see similarities between the situation for Jews today and that of pre-Nazi Germany? 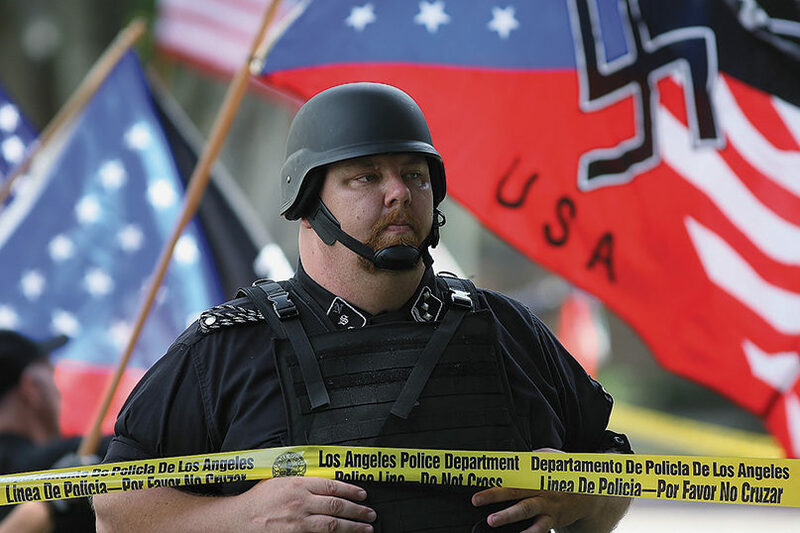 CS: I don’t think it’s like the rise of Nazism. I think the world has changed. Economies have changed. Societies have changed. And antisemitism has changed. I don’t think we should be looking so much for storm troopers with swastikas marching down the street, but we have political ideologies like the Muslim Brotherhood and the Iranian revolutionary regime and Hezbollah articulating certain ideas, and these ideas are traveling in social media. We have the Nation of Islam in the US making inroads using antisemitism in the African American community and in the artist community – there are pop artists and journalists that the Nation of Israel has reached out to and they’re making inroads in the media and entertainment industries, among musicians, athletes, and among so-called intellectuals, where these ideas are resonating. They’re very dangerous and the Jewish community needs to understand that we have to fight the scourge at a multifaceted level. We have to understand the ideology and to fight the ideology. We have to support our political leaders and policy makers and intellectuals who are fighting it and we have to join the fight. JL: When you talk about this to Jewish audiences, what is their reaction? Are they alarmed? Do you experience any push back? CS: I used to quote a Chinese proverb that says, you can’t wake up a dog that’s pretending to sleep. Fortunately, there are those of us who are dealing with antisemitism in American universities. And there are those of us in the Jewish community who were critical of the previous administration for engaging the Muslim Brotherhood and working with the, and even working with the Iranian revolutionary regime in the name of peace or whatever. There were those of us scholars who were looking at the profound implications that engaging these entities and regimes and states that were literally calling for the extermination not just Israel but of Jews had; and how in this sort of political environment speaking out against it somehow made you right-wing or racist. It was an extraordinary moment of profound hypocrisy and misunderstanding in our community and in the intellectual community. And it was alarming, not to be able to have a serious discussion about what the implications were of doing that. I was involved in the anti-apartheid movement and I considered myself a social democrat on the left, having grown up in countries where education and health care were perceived and are still perceived as human rights. This is what social democracy is all about. I remember asking people: can you imagine – at the last moment when the apartheid regime was under pressure by the international anti-apartheid movement – western leaders engaged in a rapproachment with the regime and brought to them billions of dollars in trade and contracts? Can you imagine that this would be perceived as somehow progressive? They would be rioting in the streets if we were to support the apartheid regime. Why? Because we believe in social democracy and equality under the law. We believe in democratic principles. So how was it that a large segment of our community was unable to take a strong stand against regimes that were calling for the annihilation not just of Israel but of the Jewish people around the world, using the Protocols of the Elders of Zion as a foundational ideological part of what these regimes and these movements were arguing for? How can people who believe in democracy allow for that? It’s astounding. Now, after the tragic massacre in Pittsburgh, people are saying ‘Ok, there’s a problem. We may not agree on what the solutions are or the cause of the problem, but at least we do know there’s a problem.’ It’s a good step.